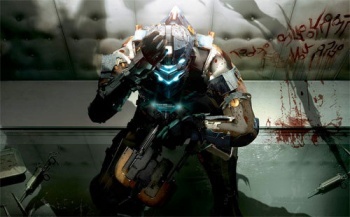 Dead Space's fictional religion, Unitology, isn't supposed to be a social commentary, says Visceral Games. Wright Bagwell, creative director on Dead Space 2, has denied claims that Unitology is a parody of Scientology. Despite certain similarities, such as a rank system, a belief in aliens, and some very high profile members, Bagwell says it was never Visceral's intention to imply any link between the two. Unitology is based around the belief that an alien marker discovered 200 years before the events of the first Dead Space game holds the secret to life on Earth. The church believes that answers to the most difficult questions that humans have ever asked about their existence are encoded in the strange symbols on the marker's surface, which it believes represents DNA. Unitology, or some of its practitioners at least, set the events of the first Dead Space game in motion, and have made an appearance in most of the other games and peripheral media. According to Bagwell, Unitology represents the illogical rationalizations that people make when they encounter something they don't understand - in this instance, the alien marker. He said that the religion had been inspired by a Carl Sagan book called "The Demon-Haunted World," which suggested that there were patterns in beliefs. In the book, the rise of technology and science began to eliminate belief in magic and superstition; but when the technology got to the point where it was too advanced for most people to understand, they started to think in superstition and illogical terms again. Bagwell said that that was the comment that Visceral was trying to make with Unitology - that people in a technologically advanced future would flock to something that helped simplify their complicated lives. He said that at no point had the studio been trying to make a political or social statement about anyone's real world beliefs. The way Bagwell talks about it, it actually sounds more like Unitology is more a comment on faith in general than one specific religion. It's clear though, that he doesn't want to offend anyone, and I wouldn't be surprised if there was more that he could say about Unitology, but won't.